This coming Sunday, August 19, will mark the 70th anniversary of the Dieppe raid. Over 6,000 men participated in Operation Jubilee, 5,000 of whom where Canadian soldiers. The operation was an attempt by allied forces to test German defenses in the small port of Dieppe and on the surrounding beaches. The military operation was a major human and military catastrophe. More than 900 Canadian soldiers died that morning on the beaches and 1,946 men were taken prisoner. Hundreds of others were wounded. Not to be confused with D-Day landing at Normandy, the Dieppe raid is profoundly imprinted in the Canadian and Québécois collective memory. "The Dieppe raid profoundly marked Canada's collective memory. Gratuitous sacrifice or Machiavellian plan for some, prelude to the successful landing at Normandy in 1944 for others, rarely has a battle given rise to such controversy. Dieppe remains forever the stage of modern tragedy." What is striking is how little is known about this event outside the Upper-Normandy region, even by the French. However, in the collective memory of the Québécois, the Dieppe raid is the source of profound bitterness and at the origin of a myth that the commanding British and English Canadian Officers sacrificed the lives of French Canadians (Québécois) to German fire as cannon fodder. The facts are far more nuanced and complex, but no less tragic. In July of 2002, after months of preparation and sixty years after the raid, I went to Dieppe to create Jubilee, an installation comprising 913 portraits of men laid in the pebbles on the beach. Mounted on cardboard, the photographs stood in place for a day, as small steles. The men depicted were, for the most part, soldiers, but also artists, colleagues, and young men; they were contemporary stand-ins for those who disappeared at Dieppe on the morning of August 19, 1942. In creating Jubilee, I wanted to stir up a reminder of this tragic event of the Second World War. My wish was to create a work in situ, right at the very scene of the tragedy, an ephemeral monument where hundreds of silent men's faces would look back at us, a photographic cemetery. 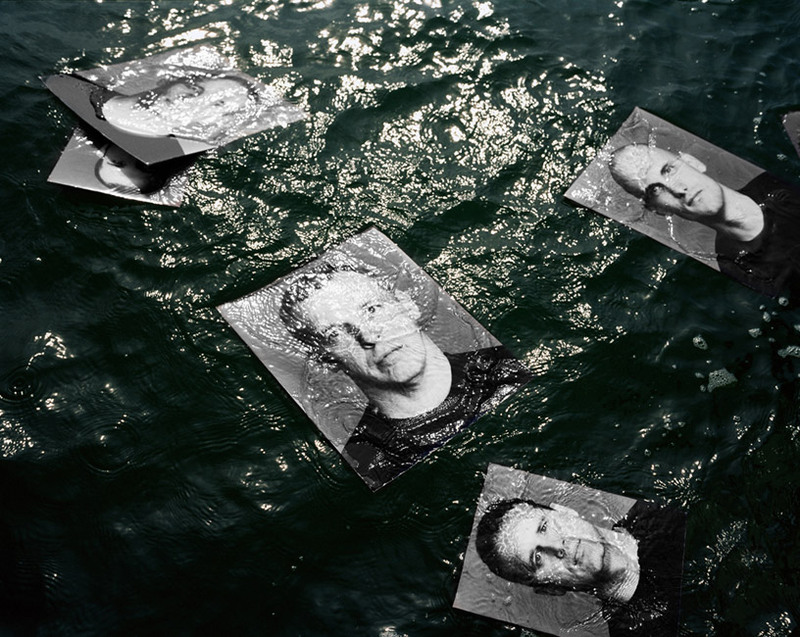 The photographs themselves then disappeared into the sea, carried off by the rising tide by the rising tide. 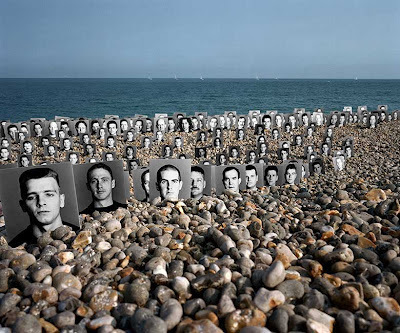 The day following the installation on the beach, I went to Varengeville-sur-mer (10km from Dieppe) and created a second installation in front of the small church there. This installation would last all summer. From an elevated vantage point, one photograph was made, situating all of the individual faces in the landscape. 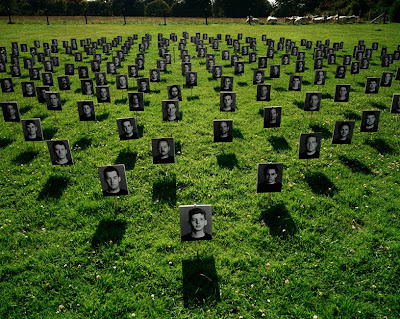 Then other photographs were taken, showing details of the installation. This series of installation views became the Jubilee project. During the following year, I returned to Dieppe in order to capture the landscape of this part of Upper-Normandy and the remains of the Atlantic Wall along the cliffs. This second series came to be known as Caux. Then came 913, a 30-minute documentary film about the creation of the installation through to its destruction, and providing some historical perspectives on the Dieppe raid. 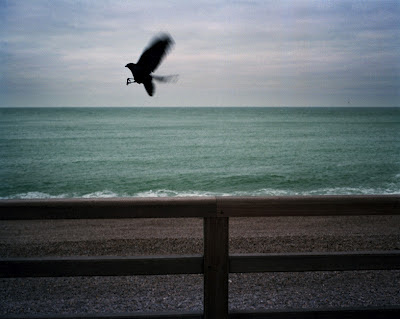 Finally, I published Dieppe, Installations and landscapes with Éditions les 400 coups in 2006. In this book, essays by Béatrice Richard, André-Louis Paré, and Didier Mouchel accompany my photographs. The film is now being shown at Encontros Abiertos à Buenos Aires (Argentina), at Centro Cultural Recoleta , August 3 to 26 2012. I'm disappointed that the town of Dieppe did not choose to show the exhibition or screen the film of this event. The Jubilee project with the 913 film will be exhibited this fall at Photovisa in Krasnodar, Russia. For this occasion, I chose to create a new work from the many original portraits. Still in the making as a finished piece, I will be posting the work on this blog shortly. * Thank you to Linda Eerme for corrections and keaping my English understantable.